The National Museum of the United States Air Force (formerly the United States Air Force Museum) is the official museum of the United States Air Force located at Wright-Patterson Air Force Base 6 miles (9.7 km) northeast of Dayton, Ohio. The NMUSAF is the world's largest and oldest military aviation museum with more than 360 aircraft and missiles on display. The museum draws over 1.3 million visitors each year making it one of the most frequently visited tourist attractions in Ohio. Admission to the museum is free. The museum dates back to 1923 when the Engineering Division at Dayton's McCook Field first collected technical artifacts for preservation. In 1927 it moved to then-Wright Field and was housed in a succession of buildings. In 1954 as the Air Force Museum it was housed in its first permanent facility, Building 89 of the former Patterson Field in Fairborn, which had been an engine overhaul hangar, and many of its aircraft were parked outside and exposed to the weather. It remained there until 1971 when the current facility was first opened. Not including its annex on Wright Field proper, the museum has more than tripled in square footage since its inception in 1971. The museum announced a new name for the facility in October 2004. The former name "United States Air Force Museum" was changed to "National Museum of the United States Air Force". The museum's collection contains many rare aircraft of historical or technological importance as well as various memorabilia and artifacts relating to the history and development of aviation. Included in the permanent collections are one of four surviving Convair B-36s, the only surviving XB-70 Valkyrie, and Bockscar—the B-29 Superfortress that dropped an atomic bomb on Nagasaki during the last days of World War II. The museum has several Presidential aircraft, including those used by Franklin D. Roosevelt, Harry Truman, and Dwight D. Eisenhower. The centerpiece of the Presidential aircraft collection is SAM 26000, a modified Boeing 707 used regularly by Presidents John F. Kennedy through Richard Nixon during his first term; after which it served as the backup Presidential aircraft. This was the aircraft that took President and Mrs. Kennedy to Dallas on November 22, 1963—the day of the President's assassination. Vice President Lyndon B. Johnson was sworn in as president aboard it shortly after the assassination; this aircraft then carried the slain President's body back to Washington. It was temporarily removed from display on December 5, 2009, to be repainted. It was placed back on display in the museum on President's Day, 2010. All presidential aircraft are now on display in their own Presidential Hangar next to the R&D/Flight Test Hangar which are both located west of the USAF Museum. 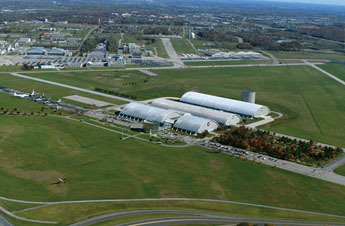 As both hangars are behind the perimeter fence on Wright-Patterson AFB property, they are only accessible to the general public by tour bus. There is a large section of the museum dedicated to pioneers of flight, especially the Wright Brothers, who conducted some of their experiments at nearby Huffman Prairie. A replica of the Wrights' 1909 Military Flyer is on display, as well as other Wright brothers artifacts. The building also hosts the National Aviation Hall of Fame, which includes several educational exhibits. The museum has a large inventory of USAAF and Air Force clothing and uniforms in its collection. At any time over fifty WWII vintage A-2 leather flying jackets are on display, many of which belonged to famous figures in Air Force history. Others are painted to depict the air planes and missions flown by their former owners. Included in the museum's displays are the jacket worn by Brig. Gen. James Stewart, P-38 ace Maj. Richard I. Bong's sheepskin B-3 jacket and boots, an A-2 jacket worn by one of the few USAAF pilots to leave the ground during the attack on Pearl Harbor, and President Ronald Reagan's peacoat. The museum completed the construction of a third hangar and hall of missiles in 2004. It now houses post-Cold War era planes such as the B-2 Spirit stealth bomber (test aircraft), the F-117 Nighthawk stealth ground attack aircraft and others. Fund raising has begun for a fourth hangar to house the museum's space collection, presidential planes and an enlarged educational outreach area, making all more accessible to the public. The museum owns other aircraft that are on loan to other aerospace museums in the United States. Most of these loaned aircraft duplicate aircraft exhibited by the museum. The museum's staff has very high standards for the quality of care/restoration of loaned assets, and has, in the past, revoked these loans when it was deemed that these other museums did not have the resources to properly care for an artifact. This happened in the case of the famous B-17, Memphis Belle. The National Museum of the U.S. Air Force is in the midst of a multi-phase, long-term expansion plan. The Air Force Museum Foundation is currently supporting a major capital construction program to expand the museum's current one million square feet of exhibit space with a fourth building that will house the Space Gallery, Presidential Aircraft Gallery and Global Reach Gallery. Additionally, the Air Force Museum Theater is in the process of upgrading its theatre from IMAX to digital 3D with a stage. This upgrade will allow for a broader range of programming, including educational presentations and live broadcasts, in addition to expanded documentary choices. The renovations will also include a 7.1 surround-sound system, audio devices for the hearing or visually impaired, and personal closed captioning systems. The museum is divided into galleries, covering broad historic trends in military aviation. These are further broken down into exhibits detailing specific time periods and showing aircraft in their historical context. Boeing B-17G Flying Fortress 42-32076 "Shoo Shoo Baby "
↑ 1.0 1.1 1.2 "History of the National Museum of the United States Air Force". National Museum of the United States Air Force official site. June 2007. http://www.nationalmuseum.af.mil/factsheets/factsheet.asp?id=430. Retrieved 2008-09-12. ↑ "Visitor info". http://www.nationalmuseum.af.mil/visit/directions.asp. Retrieved 23 November 2011. ↑ "Airfoce Museum Attendance". http://www.whiotv.com/news/19099838/detail.html. Retrieved 2009-04-05. ↑ "Home of the Wright Brothers". National Aviation Heritage Area. http://www.aviationheritagearea.org/. Retrieved 16 March 2012. ↑ Keen, Judy (November 20, 2009). "JFK Relics Stir Strong Emotions". USA Today. http://www.usatoday.com/NEWS/usaedition/2009-11-20-jfkrelics20_ST_U.htm?csp=N009. Retrieved 20 November 2009. ↑ "Air Force One temporarily off display at the National Museum of the U.S. Air Force". National Museum of the US Air Force. September 22, 2009. http://www.nationalmuseum.af.mil/news/story.asp?id=123168955. ↑ "Fact Sheet: Moon Rock". 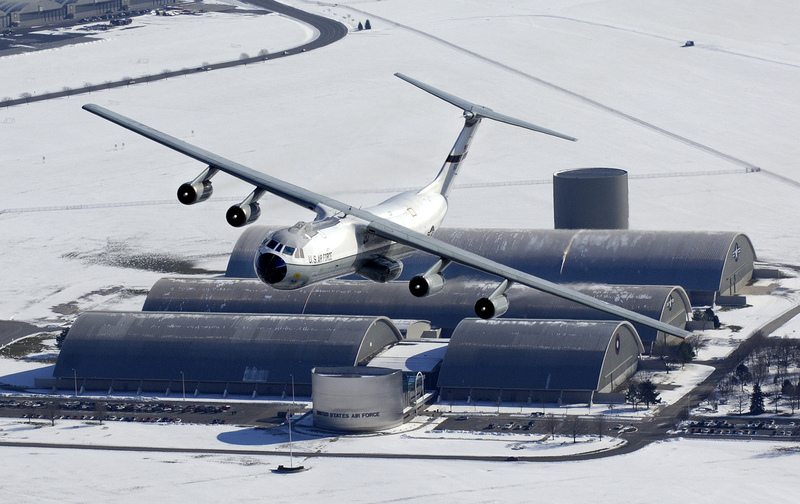 Wright Patterson, Air Force Base, Ohio: United States Air Force. http://www.nationalmuseum.af.mil/factsheets/factsheet.asp?id=7650. Retrieved 2012-07-18. "WHEREAS, several Dyersburg Masons have distinguished themselves as men of stature in our great state and nation, including the Honorable John S. Tanner, U.S."
↑ "Factsheets : USAF Established". Nationalmuseum.af.mil. http://www.nationalmuseum.af.mil/factsheets/factsheet.asp?id=1845. Retrieved 2012-02-02.